An exciting opportunity presents itself for you to join us on our second dedicated railtour of Colombia. Once considered off-limits, five decades of conflict have now ended in what is Latin America’s oldest democracy. A three-foot gauge railway system once linked this mountainous country from Buenaventura on the southern Pacific coast to Santa Marta on the northern Atlantic coast, before decay and virtual closure. Now, as part of a strategy to remove damaging heavy freight traffic from the roads, the government has awarded rehabilitation contracts for sections that have remained mothballed since the 1980s. We visit and travel on significant parts of the system, where possible using all of the operating steam fleet. One of the highlights will be to ride the daily ‘mixed’ on the electrified coal and iron ore branch through a spectacular gorge from Belencito to Paz de Rio. Our tour also visits the exquisite heritage towns of Villa de Leyva and Barichara together with La Candelaria, the historic neighborhood in downtown Bogota. Several exceptional buildings associated with Simon Bolivar who was largely responsible for creating Venezuela, Ecuador, Bolivia, Peru and Colombia as sovereign states, independent of Spanish rule are visited too. One of these is now a hotel with a hot springs pool and will be our base for one night. We also include an option for an extension in Panama riding the Panama Canal Railway and viewing the canal itself. Three days of steam haulage with visits to workshops etc. Day 1 Monday 2 September (D) We aim to arrive Bogota by mid afternoon on daytime flights from Europe and transfer to our Girardot hotel for dinner. Day 2 Tuesday 3 September (B,L,D) We commence our tour in Girardot where, across the river was the Flandes workshops of the Colombian Railways. Now all that remains is the magnificent 1930-built steel railway bridge high above the Magdalena River and a solitary locomotive. After our visit we transfer to El Ocaso to ride with rail maintenance vehicles to Zipacon, where we transfer to Facatativa to board a conventional loco hauled train into Bogota. Day 3 Wednesday 4 September (B,D) We commence our visit to Bogota with a ride to Monserrate on the funicular railway from where fine views and an the orientation of the capital can be obtained. On descending, we walk over the road to the Quinta de Bolivar, which served as a residence to Simon Bolivar after the war of independence. It is now a museum dedicated to Bolivar’s life and times. We plan to use an imitation streetcar for our journey back to the central area for a free-time lunch, then afterwards, we take a leisurely guided tour of La Candelaria, the old quarter of Bogota, followed by some free time where one of Bogota’s many renowned museums such as the Museo de Oro, Bogota’s most famous museum and one of the most fascinating in all of South America, containing 55,000 pieces of gold can be visited. Day 4 Thursday 5 September (B,L,D) We make a leisurely start, visiting plinthed locomotives at the Chidren’s Museum and the Ferroviarios Club. Our lunch will be at the Sabana terminal railway station followed by a visit to the station and workshops where there are 5 operational locos, and where we have asked for 2 or 3 of these to be in steam for photos. The station also holds a 1905 British built steam crane. After photos, we relocate to the north of the city, some 15km distant by steam-hauled train from departing from Sabana Station. Day 5 Friday 6 September (B,L) We continue our journey northwards from the adjacent Usaquen Station with a steam-hauled train using one of the other locomotives. We will proceed to La Caro Junction, from where we take the line to Zipaquira, halting for photos en route. At Zipaquira, we walk the short distance to the attractive town square for a late lunch. After lunch it is but a short transfer to the unbelievable underground cathedral carved within what was formerly a working salt mine. We will have a guided tour of the complete complex before retiring to our hotel. The evening comprises free time to enjoy the many restaurants and bars in Zipaquira. Day 6 Saturday 7 September (B,L,D) We return to La Caro junction by bus where a steam locomotive awaits then we relax and watch the Colombian landscape pass whilst we enjoy lunch on the train as we make for Villapinzon. The scenery gets much more interesting as we proceed past Suesca where we plan to make good use of the photo opportunities hereabouts. 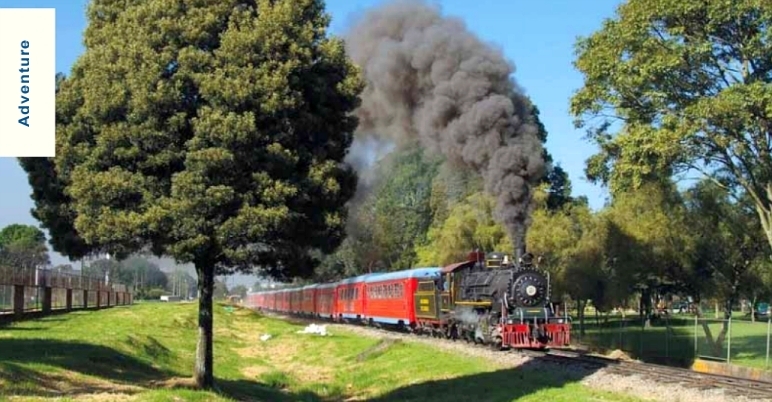 At Villapinzon, we will say goodbye to our steam locomotive and continue our journey by 1960s railcar towards Tunja for more scenic running and halts at a viaduct and tunnel. We plan to alight at a remote road crossing and transfer to Villa de Leyva, one of the colonial gems of the continent, with its enormous central square. Day 7 Sunday 8 September (B,L,D) There is an early opportunity to visit an old station, complete with preserved locomotive at Chiquinquira and then return to Villa de Leyva. After departure, we visit a site known as the Stonehenge of Colombia having many large rocks carved to resemble phallic symbols before continuing our rail journey to Paipa and our hotel, once used by Simon Bolivar and complete with a natural hot spring – take your bathing outfits to relax at in the spa waters! Day 8 Monday 9 September (B,L,D) An early start is required as we plan to photograph the outward mixed coal/ore empties from the Belencito steel complex en route to Paz del Rio and then ride in the passenger car of the early afternoon return as it makes its way through a spectacular gorge on this workaday electrified railway. Following our arrival we plan a visit to the complex to focus on the rail activity and also visit the museum where a steam locomotive is preserved before returning to our hotel. Day 9 Tuesday 10 September (B,D) We have a fairly lengthy transfer to the exquisitely preserved small colonial town of Barichara, which will be our base this evening. It is said to be the kind of town that Hollywood filmmakers dream about, a Spanish colonial town saturated with atmosphere and we will have free time there in the afternoon. After our dinner we can play the traditional game of Tejo, where a metal puck is thrown at packets of gunpowder to see if we can make it explode! Day 10 Wednesday 11 September (B,D) We make our way north to the Parque National del Chicamocha and take the aerial tramway into the spectacular canyon and out again on the other side to connect with our bus, which will take us to the colonial town of Giron for a lunch break. In the afternoon, we transfer to Barrancabermeja on the Magdalena River for our overnight stay. Day 11 Thursday 12 September (B,L,D) Today we take a most interesting and scenic journey by chartered railcar southwards for over 100km from Barrancabermeja to Puerto Berrio. This section of the railway sees no freight traffic, just a scheduled passenger service operated by the local bus provider. Our rail journey is completed by the crossing of the Magdalena River over a large road/rail bridge. After a viewing of the preserved locomotive and other rail facilities we transfer by road to Cisneros following the route of disused rail. Our accommodation tonight is a very simple but clean facility. Day 12 Friday 13 September (B,L,D) From Cisneros we continue by rail using some locally manufactured rail machines on a particularly scenic section of track past Santiago to Porcesito, where again we take to the road to complete our journey to Medellin. In the afternoon we can take a Pablo Escobar Godfather tour or ride the overhead Metro system and perhaps some of the connecting gondolas. Day 13 Saturday 14 September (B) This is our day of departure from Colombia, either returning home or coming with us to Panama. You may either take free time in the morning or visit the 4 preserved locomotives in the City. Your homeward flight will most likely be in the afternoon or evening. Day 13 Saturday 14 September (D) We arrive in Panama City from Medellin on a short late afternoon flight and transfer to our hotel for dinner. Day 14 Sunday 15 September (B,L) We commence our Panama exploration by transfer to Gamboa, where the Chagres River meets the Panama Canal to enjoy extraordinary views of the Canal from a boat voyaging along the Gatun Lake section passing by gigantic cargo ships. Our boat will pass close to rainforest covered islands (once hill tops) where we search for various items of wildlife including crocodile and species of monkeys. We lunch at the Gamboa resort after which we can return to our hotel or, remain in the Gamboa area to observe canal and rail traffic. The evening is free and one might like to ride the metro or visit the city centre. Day 15 Monday 16 September (B,L,D) Today we transfer across the Isthmus of Panama to the Caribbean province of Colon. In about 1 hour we will have crossed the continent, from ocean to ocean, after which, we drive over the Atlantic locks complex to the remains of the Castle of San Lorenzo, a UNESCO World Heritage Site built to fortify and protect the river entrance and Las Cruces Trail leading to Panama City. Lunch will be taken nearby at Shelter Bay Marina before we view the old Gatun Locks with its small ‘Mule’ locomotive museum and then visit the observation centre at the new Agua Clara locks. Our return to Panama City will be by the Panama Canal Railroad, which follows a similar route to the canal and carries some of the trans-ocean container traffic. The railway takes us alongside the artificial Gaturn Lake, flanked by the exuberant rainforests of the Soberania National Park. This evening will be our farewell dinner. Day 16 Tuesday 17 September (B) Our final day starts with visits to various parts of the Pacific side of the Canal where there are preserved rail locomotives including the Miraflores Locks visitor centre. At Miraflores we hope to get a close view of the operation of the Mule rack locomotives. We complete our tour with a visit to the UNESCO Heritage quarter of the city before we transfer to the airport. Various flight options from most UK regional airports. Please note that you cannot book a flight inclusive trip on our website but if you select the flight option you prefer then we will contact you with the flight details and convert your booking into a flight inclusive package.